Newly founded, but already famous Argentinian Photographic Museum of Humanity organized a grant contest to support young photographers. One photographer from Russia entered the short-list – Tatyana Palyga. Her project “Colorless days”, a part of the winter season of “Young photography 2010”, received a honorable mention and another proof, that the problematic of this series is still actual and unexhausted. “Colorless days” is about common known weekdays in office, which reminds endless Mobius band. It is about weekdays, when a dinner break is the most joyful and the most productive time, and the only source of bright colors and emotions is a blue water cooler and one-time dishes. French on-line journal Le Journal de la Photographie published the works of Natalya Reznik, the participant of the project “Young photography 2012 1/2. Below the surface”. Her series “Looking for my father”, published in different foreign editions, is another one example of a deep review of the past. 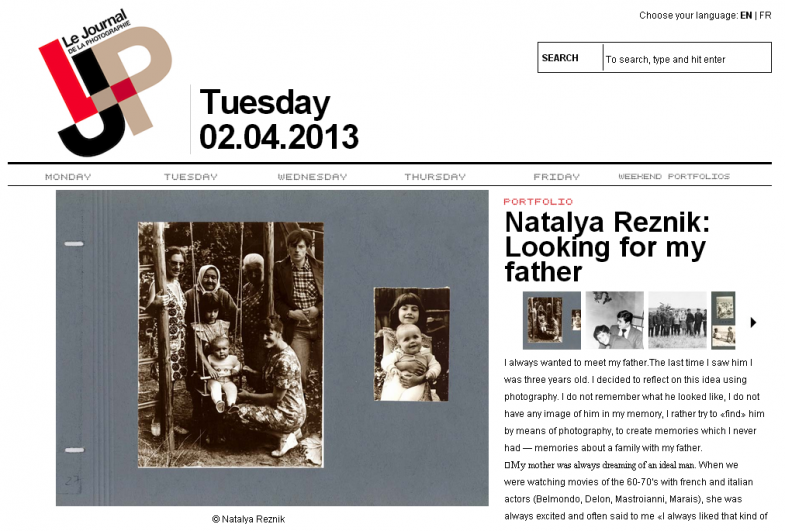 Natalya Reznik’s story is deeply intimate. She hasn’t seen her father since she was 3 years old. Making a start from several old photos, left from him, Natalya tries to recreate some new memories. She tries to build a new reality, in which it is possible to say “if father were with us…”. 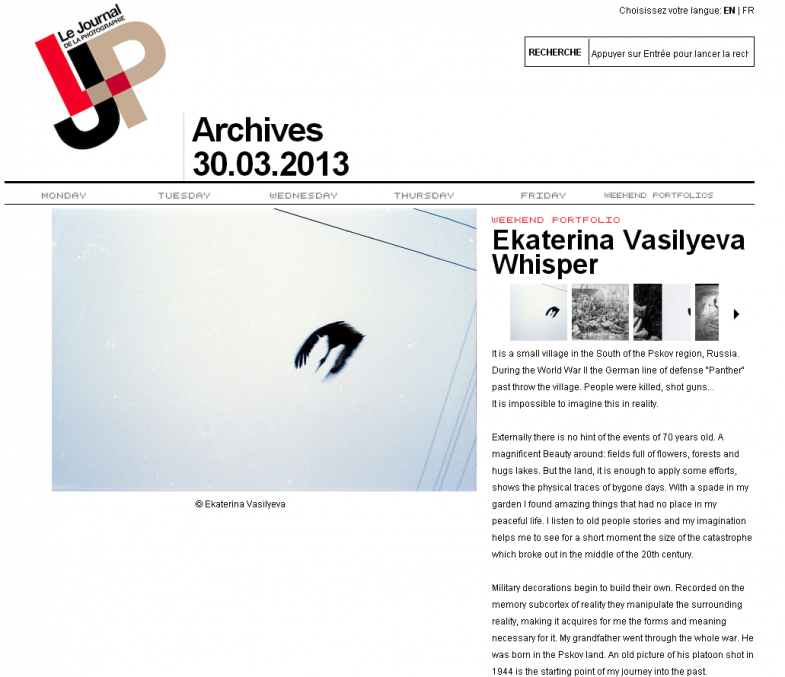 In a regular issue of a Weekend portfolio in the Le Journal de la Photographie were published works of Ekaterina Vasilyeva, a student of the program “Photography as a research”. Her series “Whisper” was shot in a small village in the South of Pskov region, where during the World War II past the German line of defense “Panther”. Nowadays it is hard to imagine in these calm places, among fields and flowers, all the horrors, which took place here 70 years ago. Death gave up its position, but left behind some souvenirs: unexpected finds in a vegetable garden, old photographs of front-line soldiers, the most of which died during the war. Starting from the old photograph of her grandfather’s regiment, Ekaterina tries to re-establish sceneries of a faded reality. 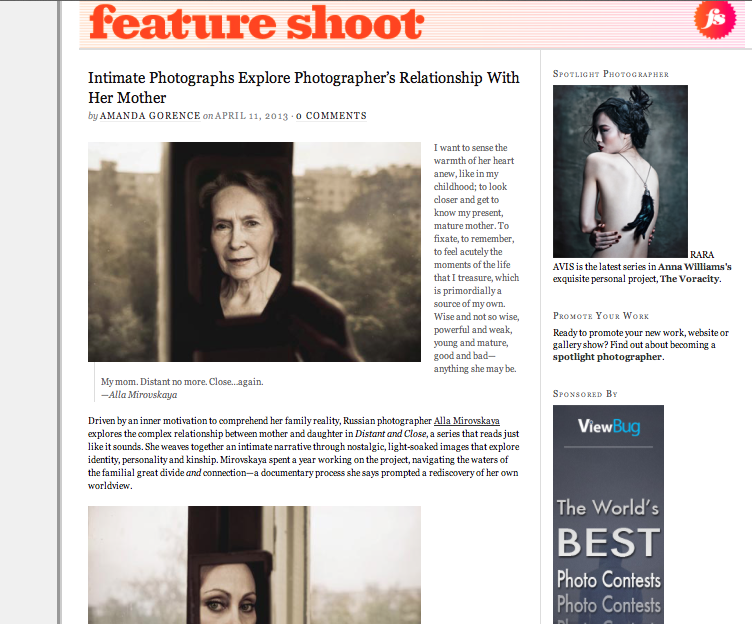 American photoblog Feature Shoot continues to publish works of Russian photographers too. Another project of Ekaterina Vasilyeva called “Russian Season”, dealing with the mythologem of Russian winter, came home to foreign audience. “She celebrates the wintery weather in her series Russian Season, where she captures the blanketing snow that decorates her country like no other, transforming it into its own fairy tale world”, – writes the author of the blog. The project of Ekaterina Vasilyeva tells us how snow really transforms the Russian spaces, how it makes to disappear terrible roads, bad smell and gloomy mood. 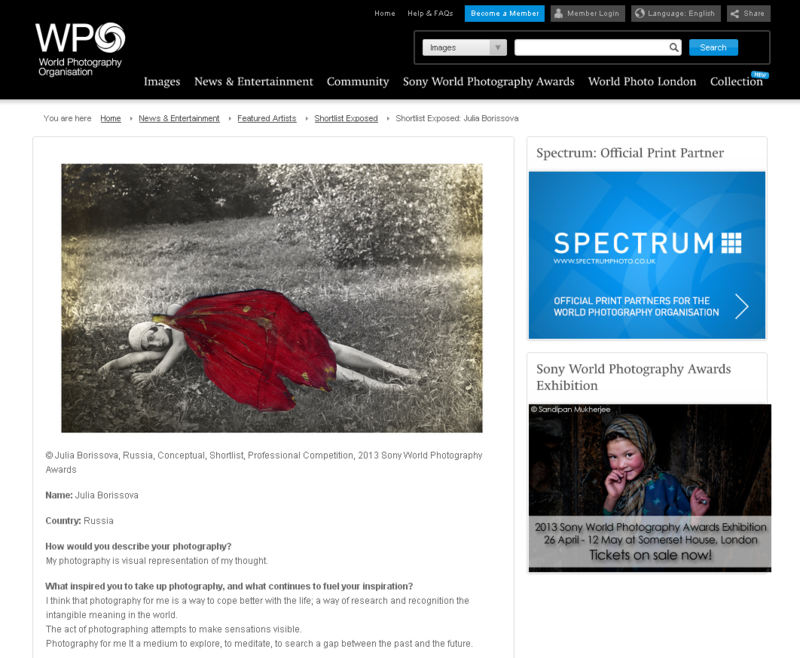 On the web-page of WPO (World Photography organization) was published an interview with Julia Borissova, the graduating student of the program “Photography as a research”. She says, that “photography is a way to cope better with the life; a way of research and recognition the intangible meaning in the world”. These words are well illustrated by her project “Running to the Edge”, which has entered the short-list of Sony World Photography Awards 2013 and has been exposed as a personal exhibition in the gallery Fotodepartament. Archival photos of emigrants of the first wave became the objects which helps us to reproduce the mechanism of memory and perception of photography. Blog Urbanautica published the project of the other participant of the program “Photography as a research” Natalia Pokrovskaya. In her work Cloud Memory she tries to understand how the functions of the usual family albums has changed and what is Instagram for us today. “Instagram photos can’t get old, they can only go away”, writes Natalia. Multimedia project, composed of 2 parts – an old album from the Paris flea market and web-site, invites us to think of the possibility of a private memory and the potential of Instagram photos in replacing traditional photos. Exhibition called La photographie du portefeuille has opened in French town Metz and it proceeds with the rethinking of the old documents and photos. This time the participants demonstrate photos, which they usually have in their wallets. One of whose who turned inside out their wallets was the photographer from Chelyabinsk Anastasia Bogomolova, the participant of the winter season of “Young photography 2012” and the student of the program “Overcoming photography”. Exhibition, organized by the association C’était où?, C’était quand?, contains wallet photos from France, Belgium, Canada, New-York, Australia and, of course, from Russia. Exposition will be opened till 4 may 2013. 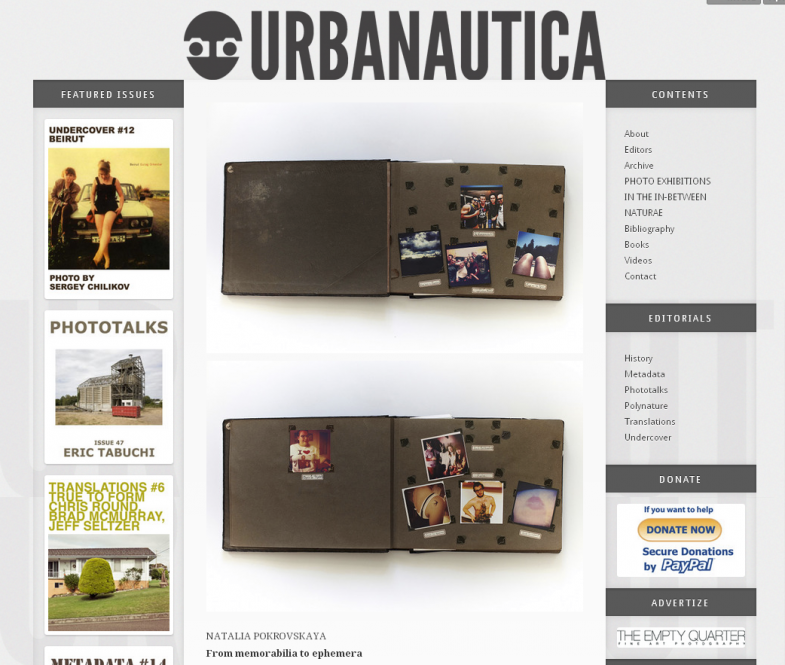 Photoblog Feature Shoot published works of another student of the program “Photography as a research” Alla Mirovskaya. Her project Distant and Close is a subtle and deeply personal story about her relations with her own mother, about attempts “to sense the warmth of her heart anew, like in childhood”. Driven by inner desire to comprehend family relationships and to recognize the reasons of emergent distances, Alla spent a year working on the project.